The Mix is now considered for more publishing traffic as compared to Google, YouTube, etc. In fact, the traffic driven through Mix produce some amazing results. It provides organic traffic that can help in building the PageRank. It allows visitors to get into interest for that particular topics. Overall, you can experience huge targeted traffic for your blog post and website. On the other hand, for premium publishers, it is a cost-effective tool to keep the things within the budget. The Mix is the most powerful way to quickly expose the trending content. Also, it offers the excellent platform to republish even very old content. It allows you to submit trending posts, photos, and videos and can grab additional attention from more and more users. Mix is the most powerful platform to build a strong network. As amongst the top web traffic sites, it can also be used as a social bookmarking tool. So, if you are already publishing & ready with the quality content, Mix it. You will be amazed at the huge visitors for your post turning towards your site. Ultimately, you can able to drive massive traffic to your blog from Mix in no time or with the least investment. If you are looking how to increase unique visitors on your website, then this social powered web browsing service definitely serves you with the quality internet marketing traffic having similar interests and likes. More traffic causes more page views so more ad revenue & more sell. 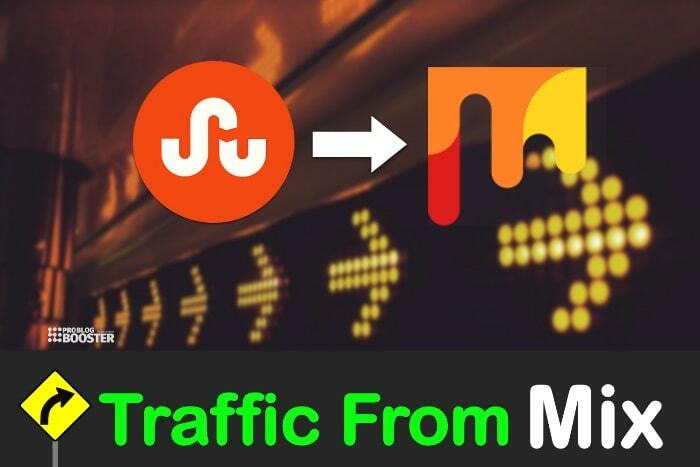 Check out how to use Mix to get traffic. If you have missed, I have published 10 Effective Strategies To Increase Domain Authority (DA) Fast in Your Blogging Niche and it will help you know better about Domain authority and assist you in improving your DA. Today I am going to share some quick but most important tips about Mix to drive targeted audience to the quality pages of your website. Go through each point and in case if you feel you can share your facts and other ways via the comment section. Well, in order to improve traffic from Mix, you need to practice certain things. Here are the important points those needs to be focused and worked hard. The first and foremost important thing is the quality of the content. Quality content is the backbone of a successful blog. Make sure that the content stands unique and fresh one. High-quality content gets more likes and these likes are counted. So always be productive in producing the content. The content should contain a headline along with a great introduction. It should have sub-titles and bulleted points so as to make it user-friendly and appealing. Adding images and videos can make the content easy and understandable quickly. Videos, images, and tutorials help increasing user’s activeness. Infographic-posts deserve more likes and are served with great reputation in Mix. All these, in turn, bring more and more targeted visitors for your website. 2. Signed up & logged into your Mix account. First of all, you need to create your public profile. In your profile, you can include your personal information, images, photos, your interests, etc. You can even add a short bio about your content. It is very important to add a hyperlink in your bio diverting the visitor towards the landing page of your website. Creating a great Mix profile helps you to ensure higher chances of being followed. Thus it is very vital to fill out every important detail in your bio so that more and more people can follow you. 3. Find & meet friends online. Mix is a great social networking site with millions of active users. It is a great platform to share great content with people having similar interests. You can make friends through this great platform and subscribe to their favorites. You can add people as a friend with similar interests. This will help you to expose great content to the correct audience and in turn huge traffic for your blog. Once you are ready with the great, attractive and appealing content, add a viral frame to it. Once the users get addicted to your content, they start following every link in it. This helps to increase the average traffic. Really, by simple Mix, you can get more blog traffic free of cost. This is something new and more effective for magnetizing the traffic. Switch to Mix shortener to enrich the world of potential from it. These shorteners support Facebook as well as Twitter which helps to share the content on a huge social platform. This, in turn, helps to generate more blog traffic that too at free of cost. The onpage Mix toolbar is yet another effective way of bringing more visitors to the blog. It offers a real-time experience by providing the Dashboard facility for easy sharing of the post. 6. Create a Peer Group to a neighbor. Mix is the ultimate social networking platform where you can find a new reader for your content. Start following the other writers and let them follow you. This will help you to share the content with more and more people. The more the number of people following you, more the number of clicks towards your blogs. For this, you need to start searching the people with similar interests. Mix serves you the great platform where you can search people with similar interests. 7. Engagement on social networking sites. Submitting your own content is just not enough. It is very necessary to be an active stumbler. For this, you can vote other people’s site, add comments on the other’s posts, make friends, recommend your site, write reviews of relevant sites, etc. This way you can make your readers value your opinion. With the engagement on social networking sites, you can be recommended as a valuable Mix member. More and more people will subscribe to your favorites. In turn, you will get huge blog traffic from Mix. 8. Build your network through consistency. It is very necessary to be very active on Mix. At the same time, you need to post on regular basis. Making new friends, participating and discovering new content consistently can make you active Mix user. Go for regular submission, reviewing the other blogs, thumb relevant articles, etc. Be active and win more and more traffic towards your landing page of the website. Reviewing other’s content can be a great path for boosting traffic for your content. 9. Increase exposure & engagement. Use Mix badges - This is yet another way to get targeted traffic towards the content. Just add Mix Badge to your content and grab the coding for the same. Customize this badge and make it perfectly suited to your site. By adding stumble button onto your blog post you can remind the people to vote for the content. You can link the profile page of the Mix to About page and encourage the readers to add you as a friend. 10. Recycle old pages for more traffic & exposure. Mix also helps you to share old and aged articles or content. Share the old content and you will get likes and Stumbles for the same. More and more people visiting the content will turn huge traffic for the blog post. 11. Try Mix paid discovery. For Brands and Publishers - In order to get organic and targeted traffic for your content, you can find some paid discovery. No doubt, Mix is a cost-effective solution, still to enhance traffic you can try paid discovery. The Mix paid discovery lets the organic traffic diverted directly to your site. The mix is the cost-effective and easiest way to bring more and more traffic for the content. It is the best social media platform where you can serve your visitors with the content similar to their interest. Mix helps to make more friends and share your content with more and more people. It helps you to remain active by submitting new as well as old content consistently. The lot of time you spend on Mix can offer you great returns. It will drive high-quality organic traffic for your blog from Mix.